Home HowTo Linux LinuxTutorial Ubuntu Ubuntu 18.04 ubuntu 18.10 How to check the CPU temprature on Ubuntu OS? Now when you run this, a new prompt will open and will ask you for a few questions. You'll need to answer Yes for all of them. 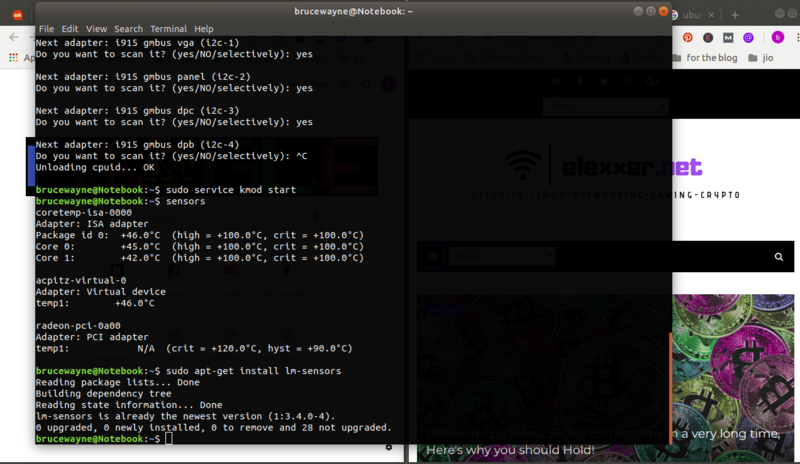 Now finally in order to see the temprature of your CPU, type in sensors in your terminal. 0 upgraded, 1 newly installed, 0 to remove and 28 not upgraded. Need to get 85.5 kB of archives. After this operation, 384 kB of additional disk space will be used. Created symlink /etc/systemd/system/multi-user.target.wants/lm-sensors.service → /lib/systemd/system/lm-sensors.service. Found unknown SMBus adapter 8086:9c22 at 0000:00:1f.3.